New Delhi: With Delhi Metro staff threatening to go on strike with the demand on pay scale revision and other things, Delhi High Court has restrained them from going on strike. The Delhi High Court has stated that closing down on metro services will cause a lot of inconvenience to the commuters. High Court has extended the order and restrained the metro staff from going on strike. As per current data, approximately 13,000 are employed in Delhi Metro and there is over 11,000 non-executive staffs. Justice Pratibha Rani extended the interim order has directed the metro employees not to go on strike till further orders and sought their response on a petition by the Delhi Metro Rail Corporation seeking that they be restrained from going on a strike. The High Court in an ex-parte interim order on June 29, had restrained DMRC staff from going on their planned strike starting from June 30. The stay has been order by HC stating that it will cause huge inconvenience to commuters. The matter is no listed for further hearing on September 4. HC has issued notice to officer bearers of DMRC staff council who were not served notice earlier. The court wanted to know from Additional Solicitor General (ASG) Sandeep Sethi, appearing on behalf of DMRC, whether the petition would be infructuous currently as the planned strike date of June 30 is over. Sethi in his reply has stated that the pleas cannot be infructuous as the employees have given three notices stating that they will go to strike if their demands are not fulfilled. Advocate Rajeev Mishra, appearing for some of the office bearers of the staff council, urged the court to direct the DMRC to file an affidavit that it will stand by the terms of settlement arrived at between the employer and the employees in 2017. The court on the other stated that it was a subject of arguments and would be dealt with afterwards. It had passed the interim order during summer vacations holding that, prima facie, the action of the metro staff does not seem to be reasonable or lawful. The court has said that DMRC is operating a public utility service that is used by over 25 lakh commuters in Delhi. These commuters hail from middle class background and use metro for daily commute. Sufficient notice has not been given to the DMRC and the conciliation proceedings are still in progress. It had said Delhi Metro Rail Corporation (DMRC) is running a public utility service which caters to around 25 lakh citizens of Delhi, who come largely from the middle-income group, on a daily basis and sufficient notice has not been given to the DMRC and the conciliation proceedings are still in development. The DMRC has challenged three notices given by DMRC staff council and DMRC employees union of June 14, 18 and 20 respectively and sought direction to pin them down from going on strike. A previous correspondence was furnished showcasing understanding between the corporation and employees. Minutes of meeting held involving its representatives and the DMRC staff council which clearly hinted that a settlement was arrived at between them on July 23 last year. The court had said it seems that there were disputes concerning execution of the terms of the settlement and it is the claim of the employees that the terms of the settlement have not be completely implemented to date. 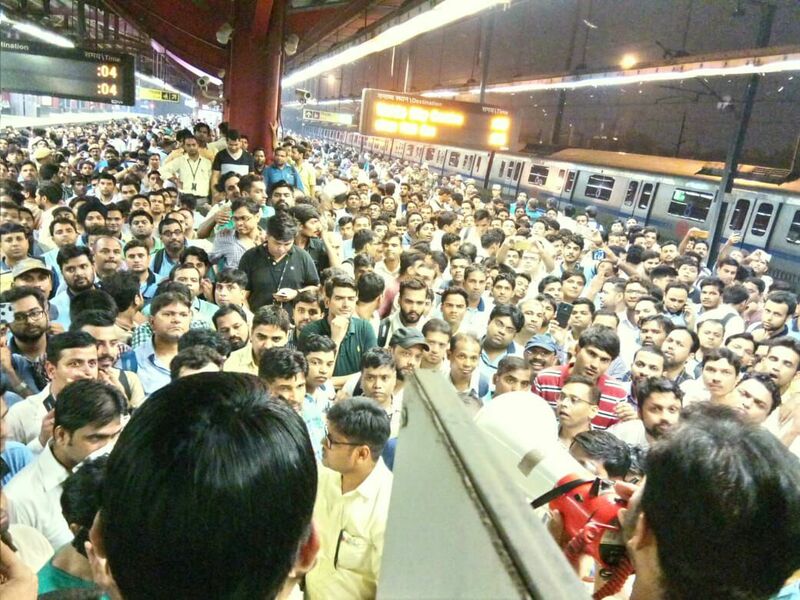 However, the DMRC maintained that the staff council was raising additional demands that were unjustified. As per records DMRC’s total liability stands at around Rs 38,685.03 crore to date. Metro staff members had also staged demonstrations at various metro stations including the Shahdara and Yamuna Bank stations from June 19. The protest was to gain support for their eight-point demand list that they had put forward to DMRC. The council members have been protesting on several issues. These include modification of the DMRC Staff Council as an employees union, revision of pay scale to conditions on sacking employees.